Fish are intolerant of changes in salinity. 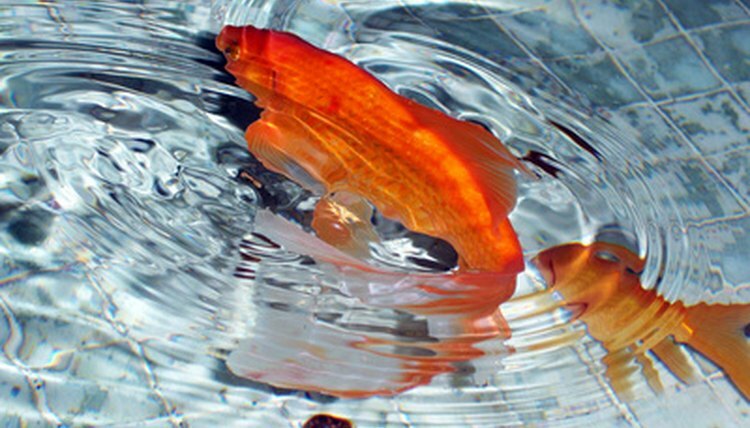 Freshwater species like goldfish or trout die in saltwater. Maintaining the precise balance of ocean salinity required by saltwater fish is tricky. Saltwater swimming pools are insufficiently salty for marine fish. Chlorine kills. Fish excreting into the pool also makes this combination unsuitable. Osmosis is the process of water moving from a weaker solution into a stronger one, through a membrane -- in this case the fish’s skin. Freshwater fish are equipped for freshwater, where water moves into the body by osmosis and salts are absorbed by the gills. Only saltwater species are adapted to handle osmotic water loss and to excrete excess salt through the gills. Drinking copiously, saltwater species excrete little because their bodies lose water by osmosis. Conversely, freshwater fish drink little but excrete copiously. Placement in the wrong environment strains kidney function, causing death. Salmon, eels, lampreys and bull sharks tolerate varying salinity, spending different life stages in salt and freshwater. Even these fish cannot transfer from freshwater to salt without a period of adjustment. They spend time in brackish estuaries between moving from river to sea. They are largely unsuitable as pet or ornamental species, although historically lampreys were kept in saltwater pools as food fish. Kentucky State University Cooperative Extension: Why Can Some Fish Live in Freshwater, some in salt water and some in both? Reef Quest Center for Shark Research: Why do Most Sharks Live in Salt Water?